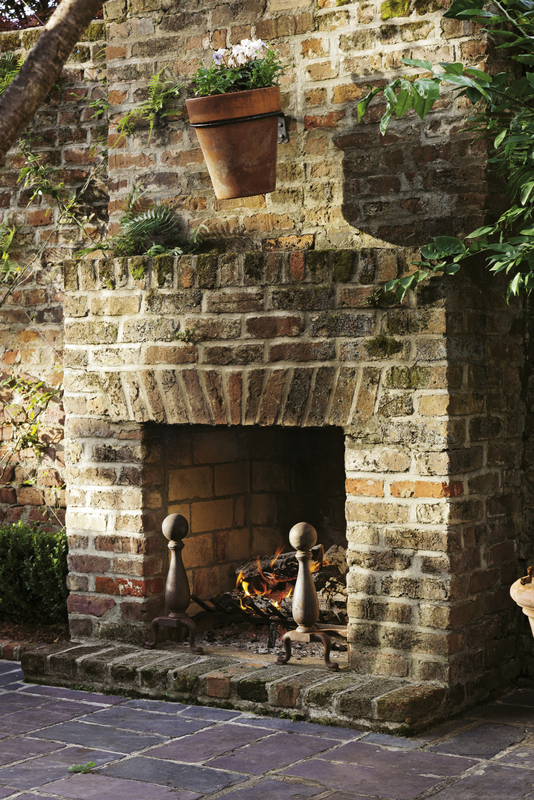 The French Quarter has wooed many an out-of-towner with its romantic charms—think pastel-hued row houses, cobblestone streets, flickering gaslight lamps, and world-class restaurants and art galleries. Nobody understands this more than Peggy and Woody Rash. 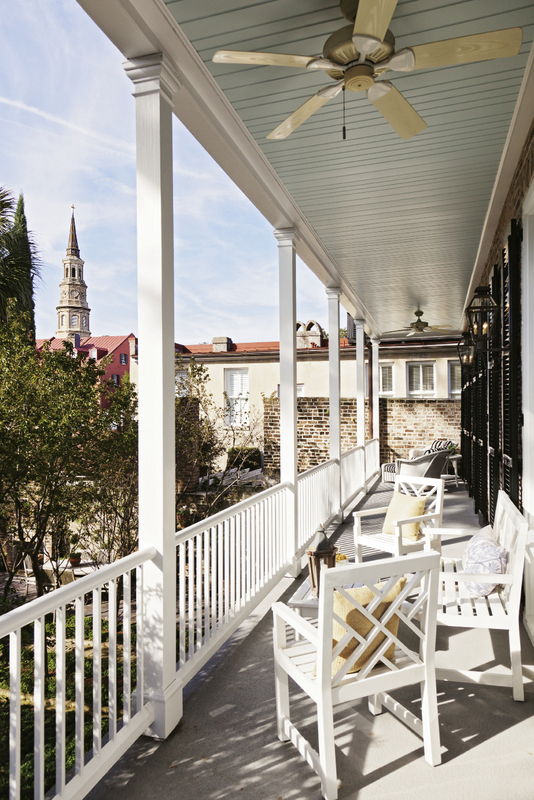 After years of living in the Midwest and holidaying in Charleston, they were so smitten that they bought a vacation townhome in the neighborhood. 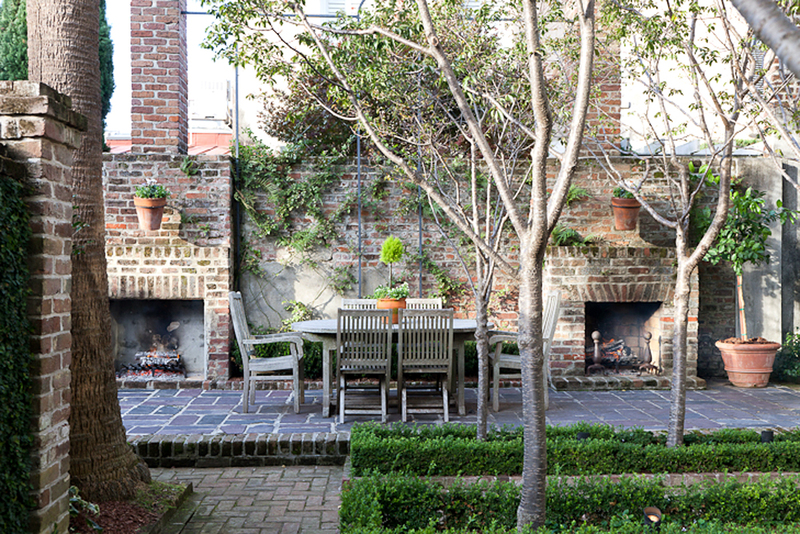 For these empty-nesters and history lovers, the apartment, which occupied half of a circa-1853 brick building, was a gem, complete with 19th-century heart-pine floors, a rear garden with outdoor hearths that once powered a (now long-gone) kitchen house, and a second-story piazza offering sweeping views starring the steeple of St. Philip’s Church. 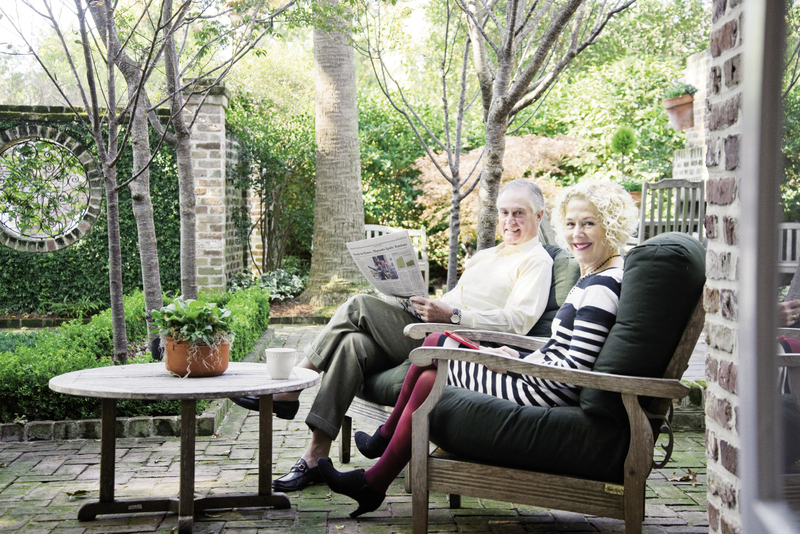 The Rashes found themselves enjoying their time here so much—“it’s such a vibrant place, we can walk to the water, people are always out and about,” Woody says—that they sold their Chicago abode and took up full-time residence in the Holy City. And that’s when they started eyeing the townhome next door. 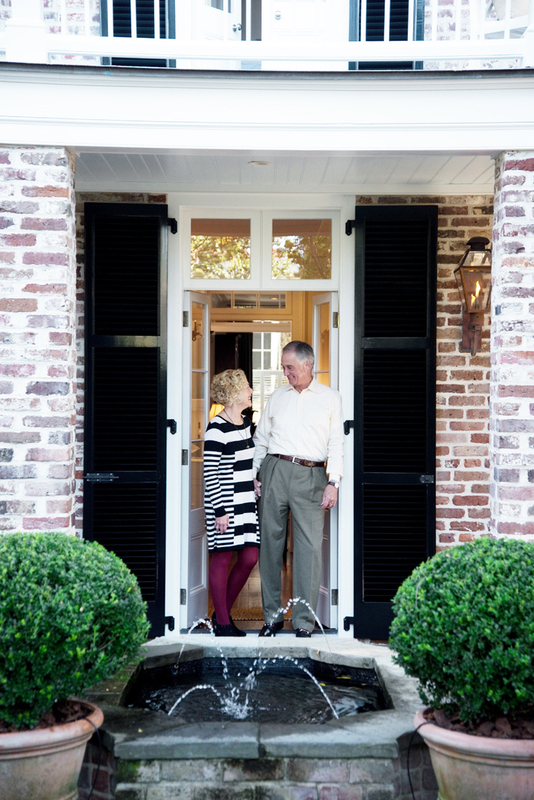 While their 1,500-square-foot space was perfect for short stays, “we realized it really wasn’t big enough for us to live in full-time,” Peggy notes. As luck would have it, their neighbor was looking to sell, so they bought the adjoining unit and set their sights on renovating the two apartments into a single-family home. 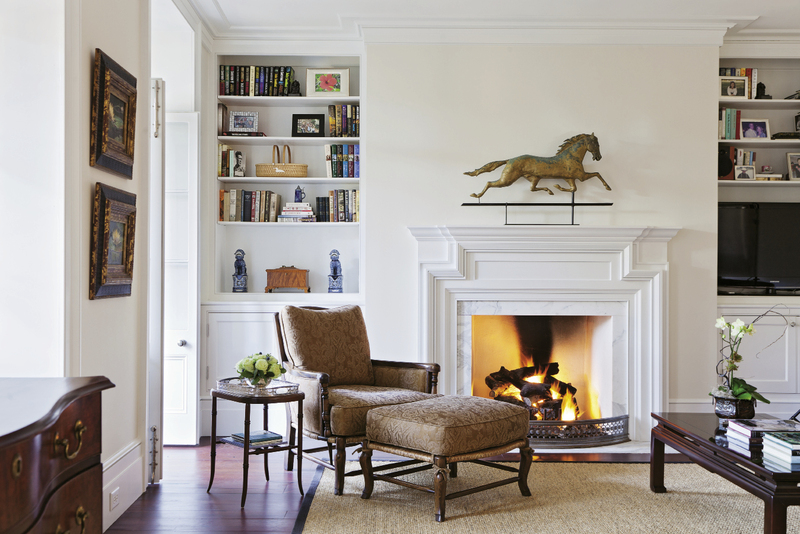 Today, the graceful 4,000-square-foot manse feels like a cohesive whole. 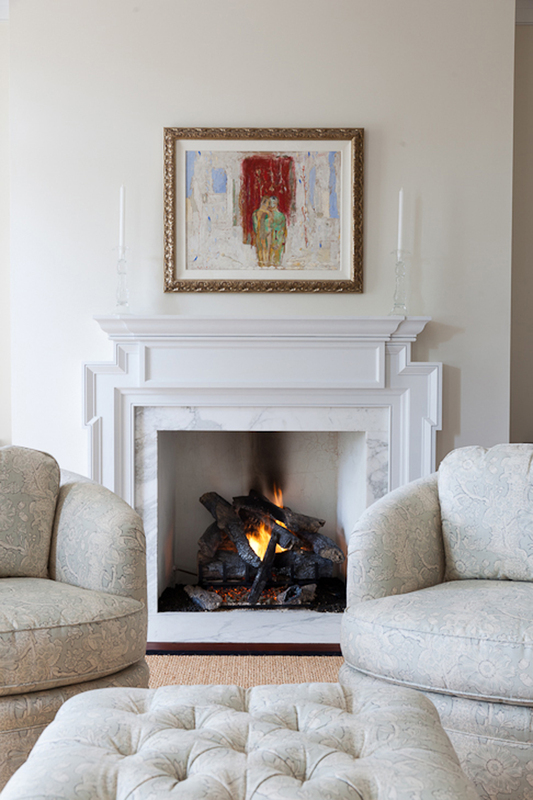 Certain architectural elements such as detailed mouldings and fireplaces with plaster-coated mantels—some original, most crafted to match the architectural style of the 19th century—repeat throughout, creating a pleasing visual consistency. 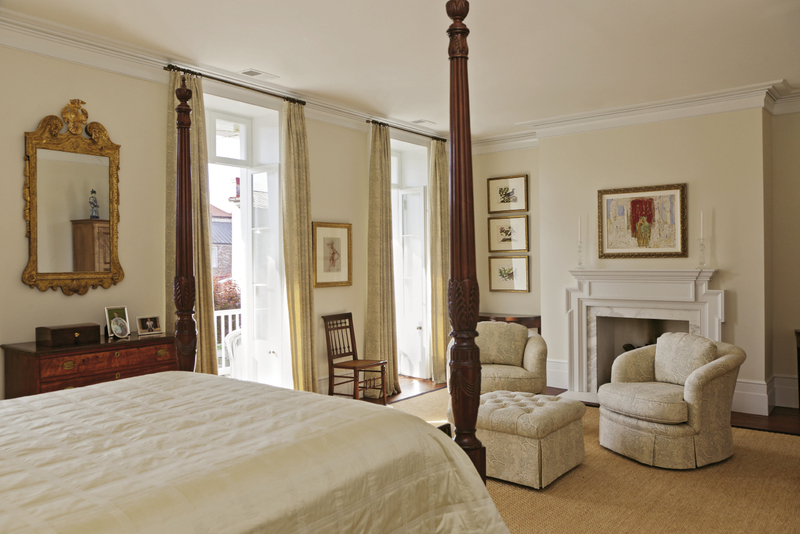 And classically appointed rooms filled with antiques, works by renowned area artists (such as John Carroll Doyle and Elizabeth O’Neill Verner), and a few modern upholstered pieces cultivate the feeling of a comfortable, refined, and distinctly Charleston abode. 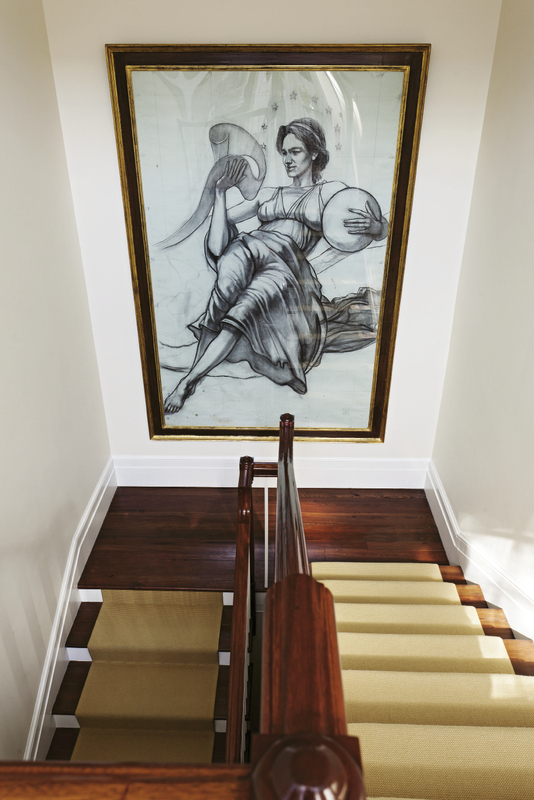 But at the outset, the renovation project seemed daunting, in part because of the structure’s unique pedigree. Built for a prosperous area shopkeeper in the mid-19th century, the building was originally designed as two first-floor storefronts and a second-floor apartment. “That’s why there are two front entrances—because of the two shops,” Peggy notes. “And there was a wall right down the middle, separating the two.” In the late 1970s, it was renovated into two conjoined townhomes—probably because the first floor was already broken up into distinct halves. 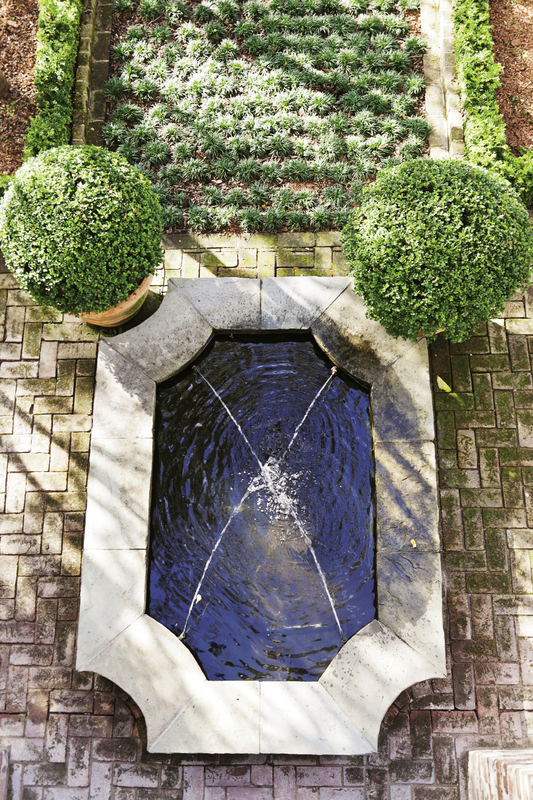 To meld what had always been separate quarters into one inviting space, the couple enlisted area architect Randolph Martz, a neoclassicist who’s restored many old residences in the area. 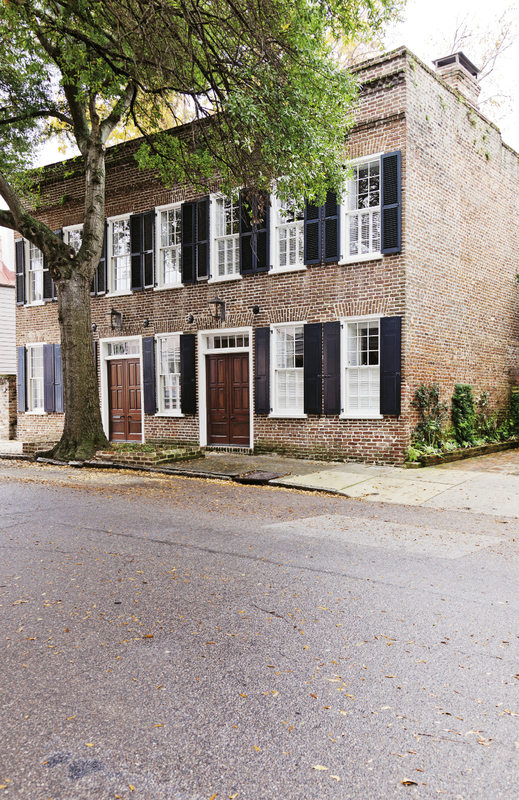 “Randolph had a vision to bring the house back to what it might have been—a formal Charleston home—even though it was originally shops,” Peggy says. 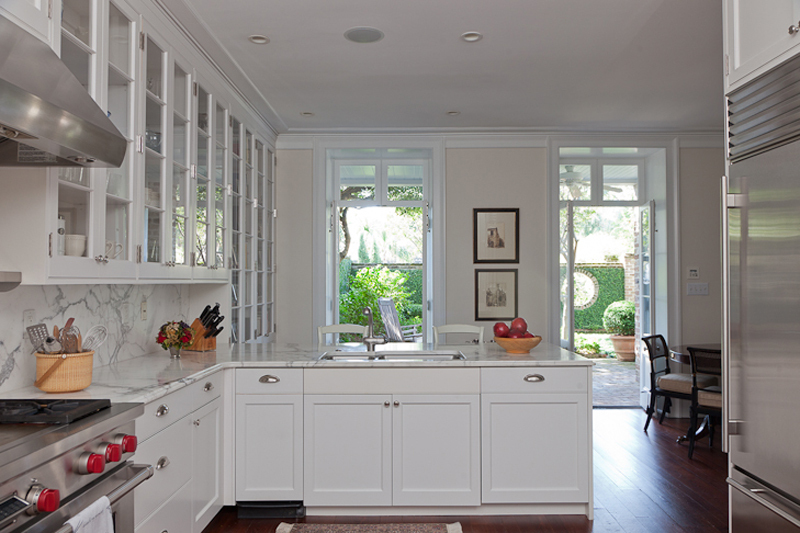 They also brought on contractor Happy Finucan of Harper James Finucan Inc., who also boasts many years of experience working with historical buildings. 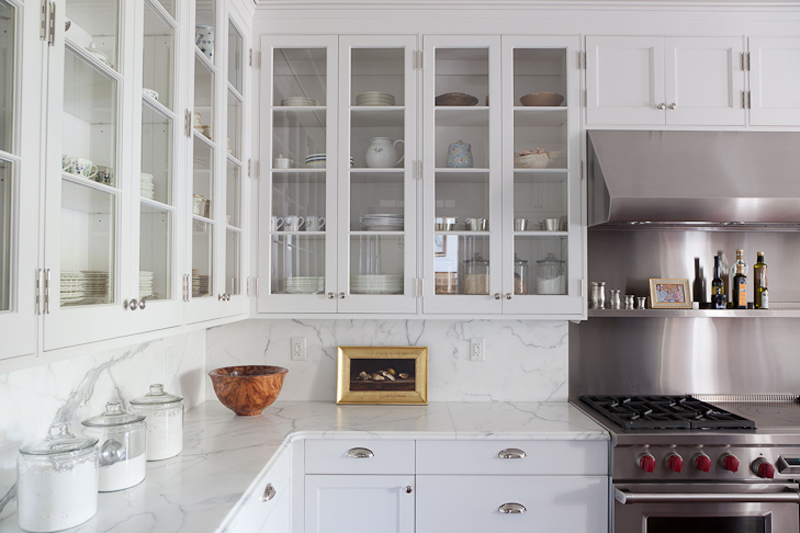 Post-reno, the couple loves the house’s new layout, which was designed by Martz. 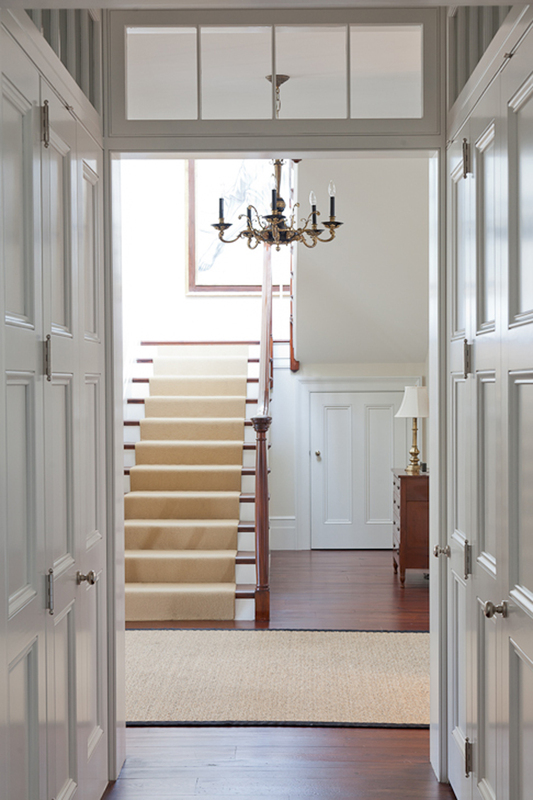 To unite the space, he removed the wall separating the two halves of the first floor, swapping in wide hallways and open doorways intended to draw people in. 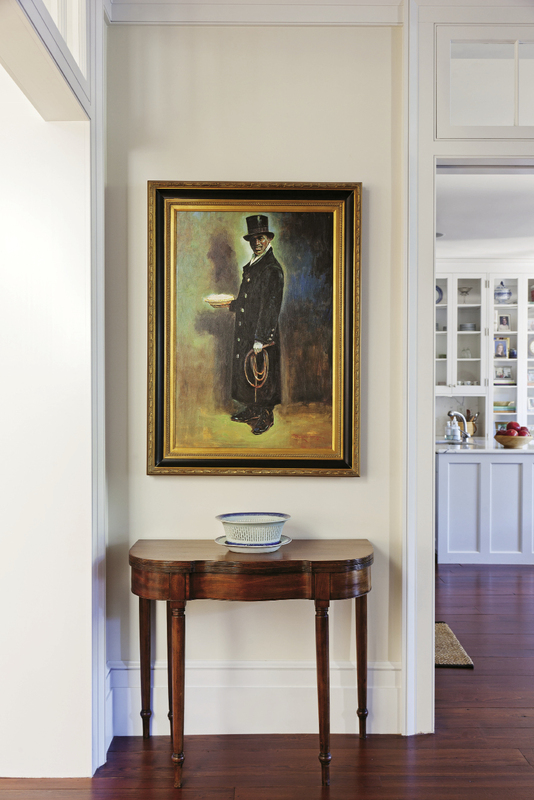 And thanks to interior transoms, the four rooms on the ground floor—two parlors, a dining room, and a kitchen—flow into each other in an airy, natural way. Upstairs, the floor plan was also simplified. “Before, we had two bedrooms, and the townhouse next door had two bedrooms, with bathrooms railroaded down the side,” Peggy says. “But for Woody and me, that was just too many rooms.” Martz combined the rear half of the second floor into a single master suite, complete with a spa bath and sitting room; the two street-facing bedrooms serve as guest quarters, which come in handy when the Rashes’ three children and two grandchildren come to stay. Due to Martz’s neoclassicist bent, symmetry is seen throughout. “If there’s one closet door, he wants another for balance,” Peggy explains. What they couldn’t salvage, they worked to reestablish. 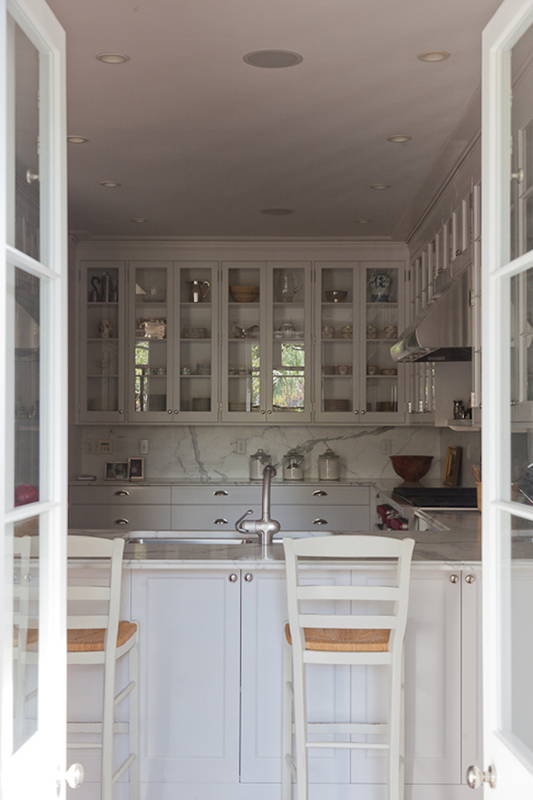 For example, a 200-square-foot rear addition, built by a previous owner to allow for a breakfast nook off the kitchen, was removed to restore the home’s original footprint. “We actually gave up that square footage because we felt it was important to bring it back to the way it was,” Peggy says. 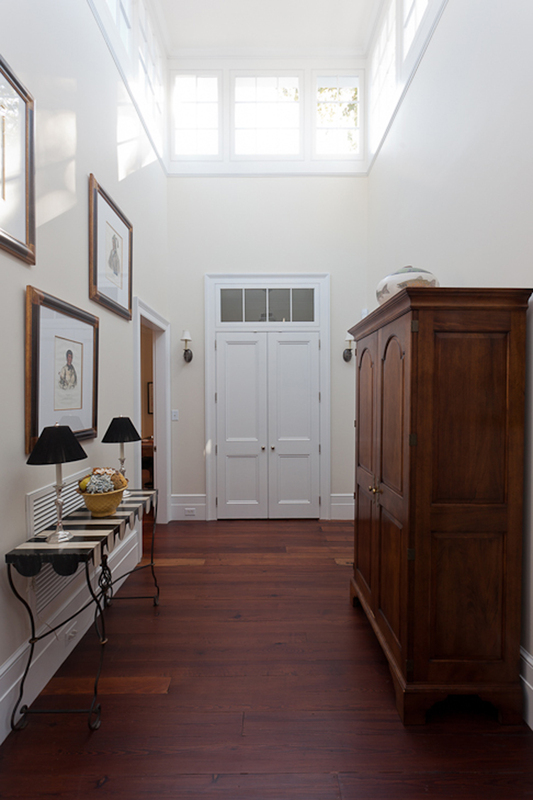 Similarly, windows and skylights added in recent years were removed, as was a side walkway that wasn’t original to the residence. 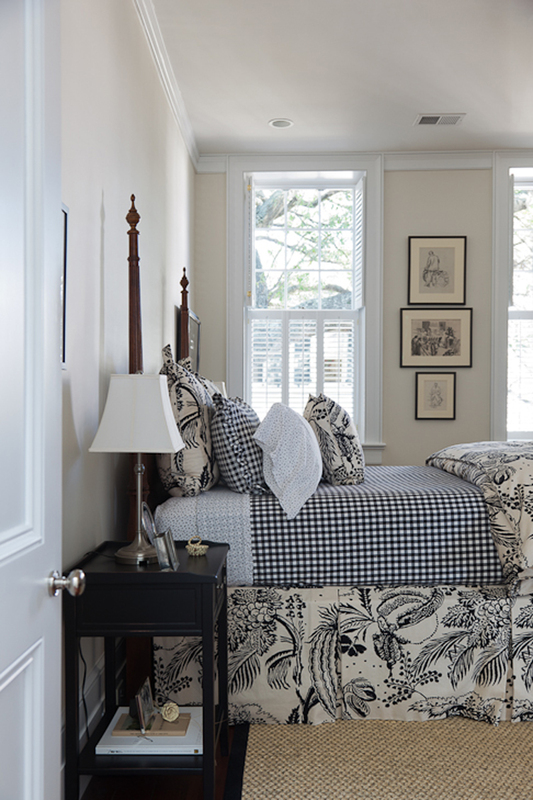 Once the renovations were complete, Peggy delved into the interior design, which she defines as classic and a touch eclectic. 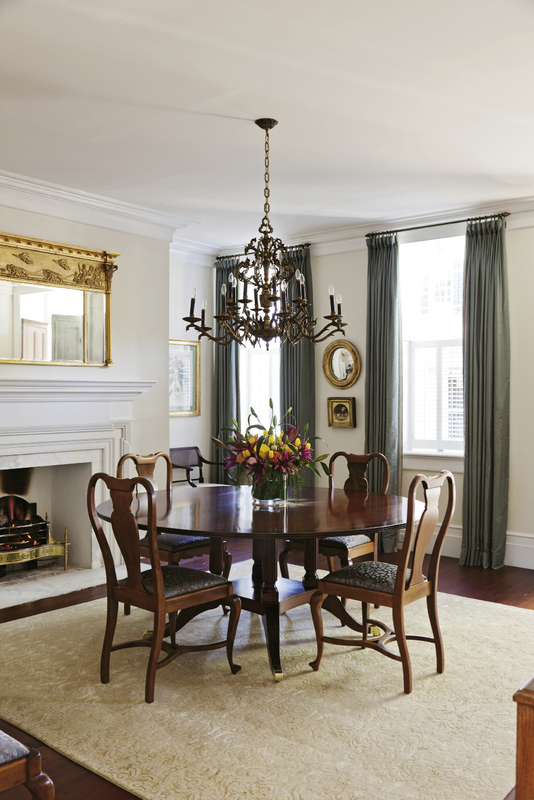 “If I lived in a period house, I would have stayed in one period with the décor, because it would have been so appropriate,” she says. 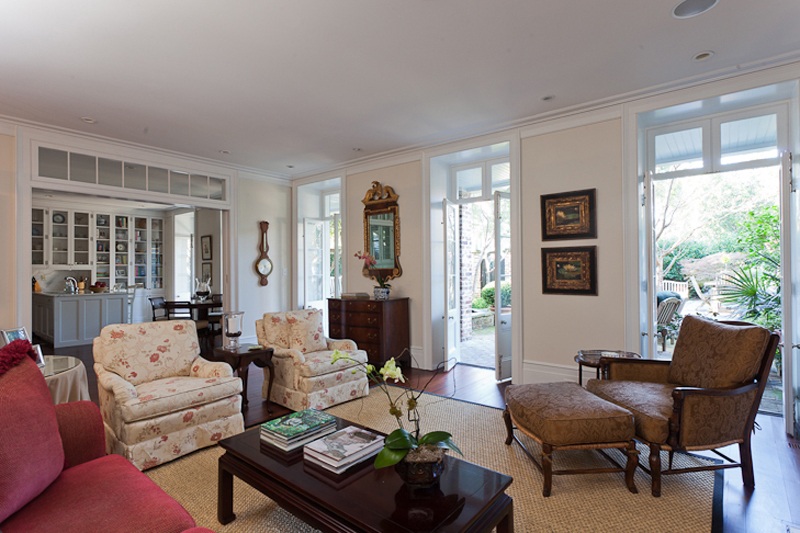 “But because we were able to make the flow a little different from the typical Charleston home, the furnishings are bigger, the couches more comfortable. 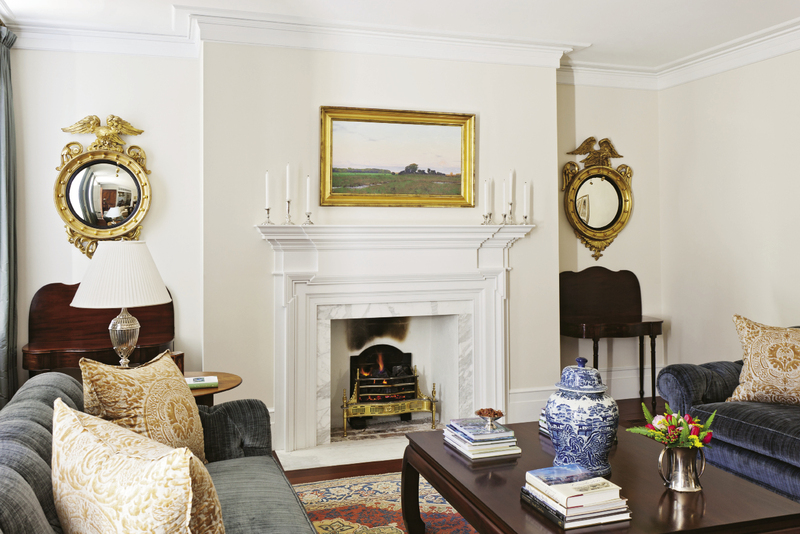 And we have more wall space for art.” Treasured old pieces, such as an antique weathervane and an ornate 19th-century mirror that was once on display at Winterthur Museum in Delaware, mix with custom new pieces made in an old style, such as the round dining table crafted by a North Carolina artisan. 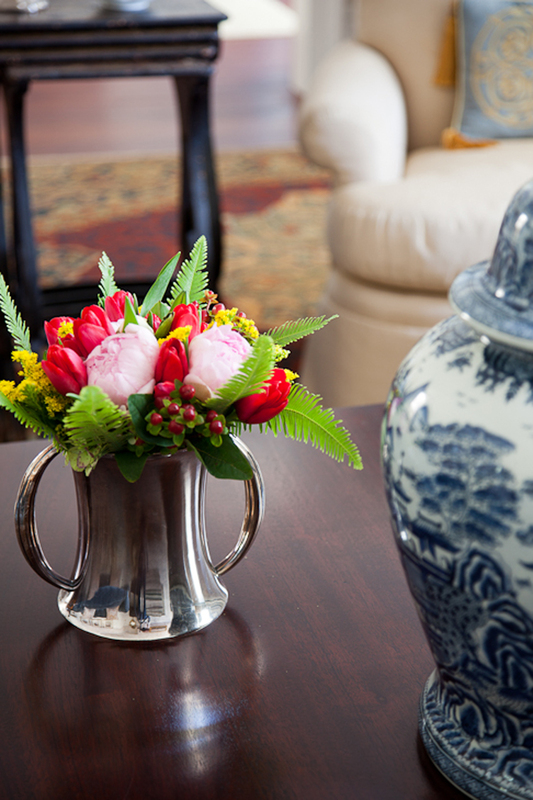 A few Asian antiques, such as blue-and-white porcelain pieces, round out the mix. 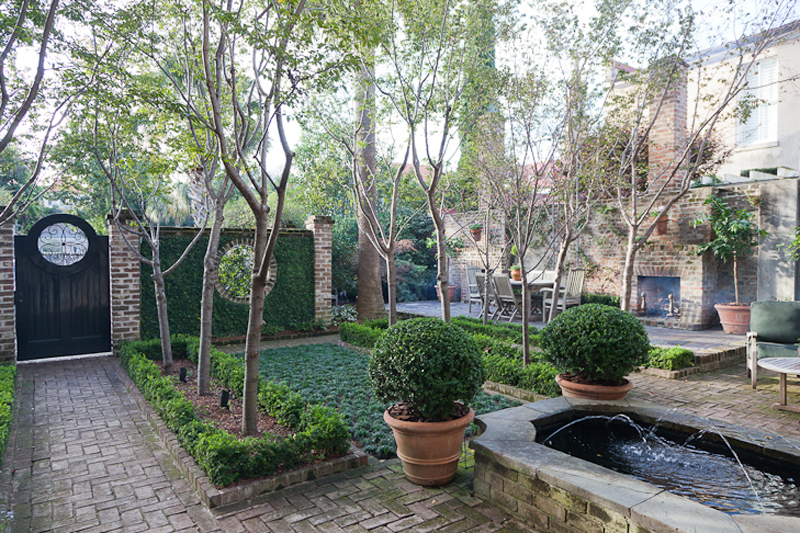 With the interior thus designed, the Rashes turned to landscape architect Sheila Wertimer (and later, Paul Freeman) to reimagine the rear courtyard’s two separate gardens into one. 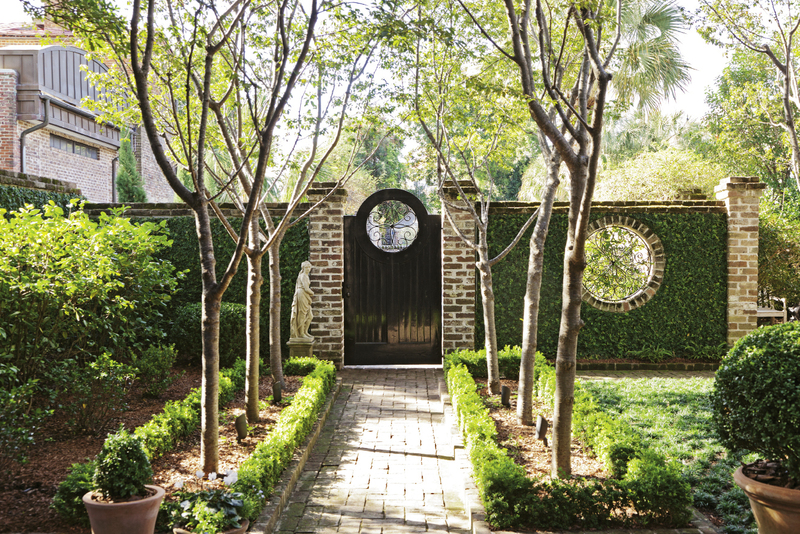 Not surprisingly, the history-loving couple craved a traditional Charleston garden, so Wertimer selected plantings such as camellias, azaleas, gardenias, and climbing roses. 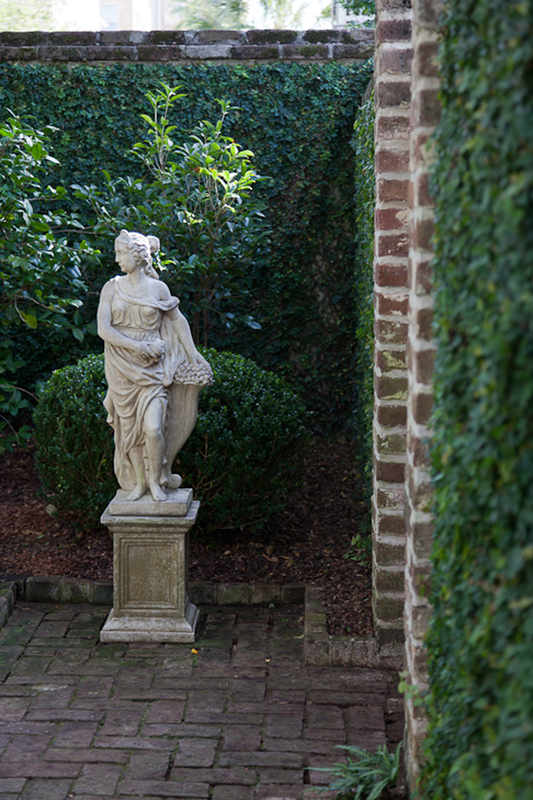 And, as a nod to the symmetry of the abode, she designed symmetrical rows of boxwoods, dotted with a balanced array of cherry trees. 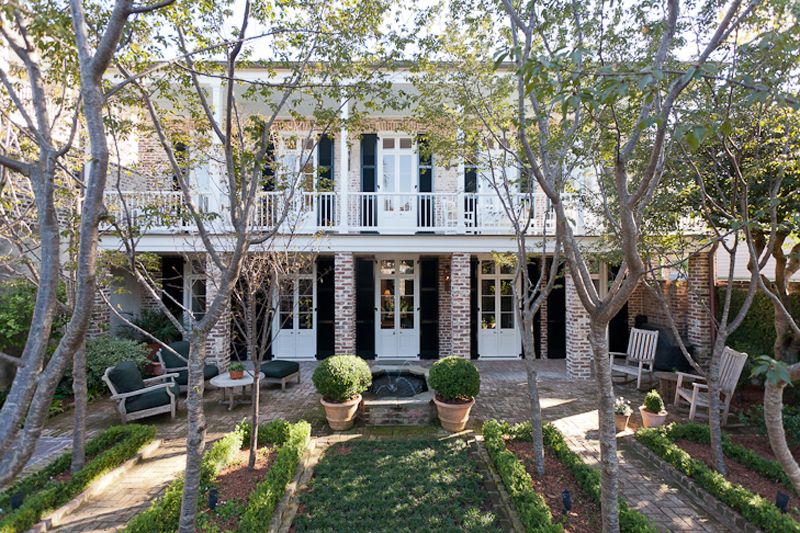 The Rashes can often be found here amongst the greenery, sipping coffee on a Saturday or hosting guests for an oyster roast or intimate dinner party. 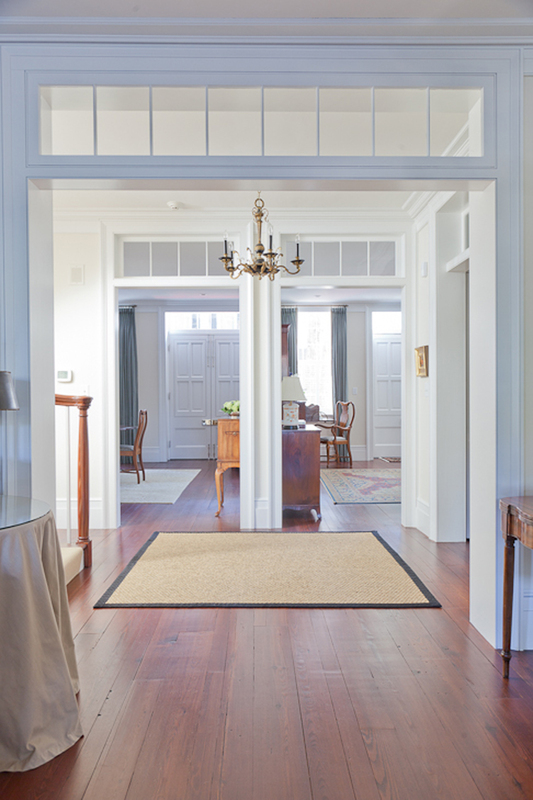 No matter the occasion, they’re always reveling in their restored dwelling and all the rich history that comes with it. “We just love the fact that we were able to bring it back,” Peggy says.